© 2012 by Carly Fierro all rights reserved; content may not be copied, rewritten, or republished without written permission. Wallpaper can dramatically change the look of any room in just a few hours. According to the non-profit organization The Historic New England, wallpaper (or painted paper) first appeared in the mid-16th century. These first luxurious materials were silk, leather, wool damask, and Italian velvets. Needless to say, only the wealthy could afford to cover their bare rooms. Nowadays, wallpaper can be very affordable, but there are of course still premium, hand-crafted options for a dose of luxury. 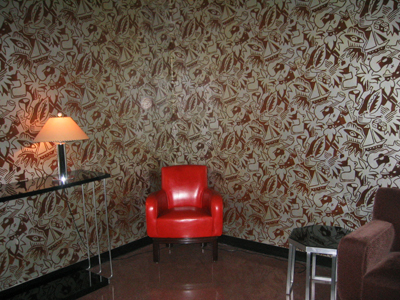 Either you or a professional can artfully hang wallpaper. Save money on installation fees with these easy tips for hanging like a pro. This Old House gives some great tips on wallpaper hanging. The entire process for a medium-sized room should take about seven hours. This timeframe may vary according to the kind of wallpaper you buy. According to expert John Dee, the easiest wallpaper to work with is paper-backed vinyl. If you choose a pattern with a dominant element, mark the focal point of the room, which is usually the middle of the first wall a person sees when entering. Know where your seams are going to be before you begin by pasting two short strips side by side, allowing for the focal point to reign supreme. Mark them around the entire room so there arent any surprises down the road. Once the room is marked, hang the first full sheet (drop) of wallpaper, allowing for overhang. At least one inch on the top and bottom is necessary. The first drop on any and every wall wall must be perfectly plumb. The most reliable way to do this is to employ a helper, use a ladder and a plumb bob, pencil-mark at the ceiling and floor, and snap a chalk line. Always hang the paper from top to bottom. Run a moist sponge along the edges to avoid lifting at the seams. Use a plastic edger (squeegee) to gently pull (never push) the paper from the center outward and downward. Make sure the paper is securely pasted against any baseboards or moulding. When it comes to home improvement tasks like these, such as working with contractor estimating software or taking measurements, attention to detail is critical here. Once the paper is hung wrinkle-free, the project isnt over. Never skimp on removing the excess paper. This takes just as much precision as hanging. Youll need a box cutter or utility knife and wide drywall floating knife to get perfect precision. Hold the putty knife against the baseboards, moulding, or ceiling and gently slice the box cutter along the flat putty knife. Some excess glue will be visible. Gently sponge off the edge of the paper with a wet sponge which you wring out after every wipe, pressing the wallpaper against the walls. You can sponge-clean the surrounding areas at this point, too, to clean any leaked paste. Its best to cut off the excess after hanging each strip so that any leftover paste is still wet and easy to remove. Picture-patterned wallpaper never overlaps except in one place: the corners. If you use a pattern, this is where you must pay special attention to matching it up. About ¼-inch is ideal for overlap. Make sure that the overlap isnt directly on the corner but slightly to the side. This will prevent seams from lifting if someone brushes against the corner. The joints on the drops in the field, on the other hand, must be lined up carefully; you dont want to deviate from your perfect-plumb start. This will require you to proceed slowly and carefully and making minute adjustments. Remember that every tiny mistake will be reproduced exponentially with every subsequent drop. Avoid this by making every drop as perfect as possible. If your paper isnt picture-patterned, but rather a vertical corduroy pattern or something similar, you can overlap as much as you want, as long as you maintain plumbness. Just use the technique of double-cutting. Overlap by an inch or so, squeegee everything down tight, and then, using a straightedge such as a drywall T-square, use your knife to cut through both drops in the center of the overlap. Now, peel off the top cut joint strip and discard it. Next, peel that drop off the wall enough to remove the cut strip from the first drop and discard. Finally, squeegee the joint back together; it should be perfect! Do you have any tips to make this wallpaper-hanging DIY job easier? Feel free to share them in the comment section below. Carly Fierro is an aspiring writer who is constantly looking to expand her portfolio by creating content on a plethora of subjects. She has a wide variety of interests and loves writing about anything and everything. She loves that blogging allows her to share her writing with people all over the world.